Europe’s leading nicotine product conference returns in 2018 for its 5th outing! 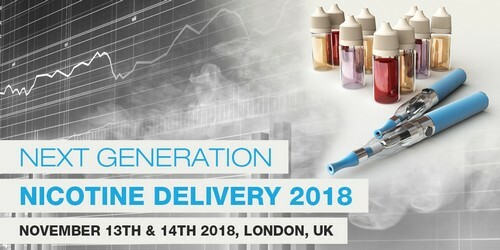 Held in London, the Next Generation Nicotine Delivery Conference spotlight’s market trends, public health opinion and product innovation – presenting an open learning forum with valuable take home messages, interactive sessions and leading speakers from across the industry. Key themes that the event will address include understanding customer demands, assessing the CBD phenomenon, and spotlighting on product standards. The Next Generation Nicotine Delivery conference is Europe’s only commercially-driven platform designed to provide insight into the sector, whilst reviewing methods to attract more smokers to alternative nicotine products, leading to increased sales and profitability.